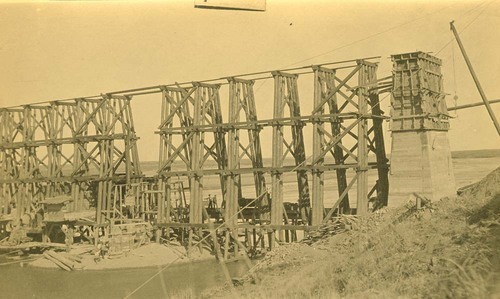 This photograph shows Atchison, Topeka & Santa Fe Railway Company workmen, construction equipment, piers, plank forms, and materials at the Pecos River in Abo Canyon, New Mexico. Construction began in 1905 and was completed in 1908. Use this photograph to discuss how, with advancing technology, new infrastructure had to be built to support the new modes of transportation.